The portal, which opened at 9am today (Monday 11th June) will remain open until Friday 13th July 2018 at 11.59pm for contractors to complete their declarations. Although the review date is not until Friday 29th June 2018, contractors can start adding data for the criteria they have already achieved and will be able to re-enter the portal to add information at a later date before the portal closes. However, contractors must remember to re-enter the portal and submit the declaration before Friday 13th July 2018 at 11.59pm otherwise they will not be entitled to a Quality Payment. NHS BSA has published a document which outlines the questions that will be asked so contractors can view these ahead of making their declaration. Q. The declaration portal opens on Monday 11th June 2018 which is before the review point (Friday 29th June 2018). Can I submit my declaration on the NHS BSA website for a Quality Payment before the review date? Contractors can start adding data and will be able to re-enter the portal to add information at a later date before the portal closes; however, contractors must remember to re-enter the portal and submit the declaration before Friday 13th July 2018 at 11.59pm otherwise they will not be entitled to a Quality Payment. Contractors can also submit their declaration before the review date, if they know they will definitely meet the criteria they are claiming for before the review date. Contractors are, however, reminded that once their declaration has been submitted, it cannot then be altered. It is therefore imperative that contractors are satisfied that the information they submit is correct. No. Evidence does not need to be submitted during the declaration process. However, contractors’ declarations of compliance with the gateway and quality criteria will be subject to checks by the NHS BSA, when they undertake post-payment verification of the scheme on behalf or NHS England. A Quality Payments Scheme, which forms part of the Community Pharmacy Contractual Framework (CPCF), was introduced on 1st December 2016. The original version of the scheme ran until 31st March 2018 and a total of £75 million was paid to community pharmacies for meeting the specified quality criteria.In March 2018, it was announced that the scheme would be extended for the first six months of 2018/19, as part of interim arrangements prior to substantive negotiations for 2018/19 being undertaken. The extended scheme has a review point in June 2018 and funding of £37.5 million; it is largely similar to the 2017/18 scheme, with just a few minor changes which are summarised in a PSNC Briefing, available below. As you are aware earlier this year the Quality Payments Scheme was agreed for the first six months of 2018/19, it was agreed that a further £37.5 million is to be invested into an extension of the scheme with a June 2018 declaration. The requirements for the declaration will operate much the same as the 2017 declarations, however there have been some changes made to both the gateway and quality criteria. The Primary Care Commissioning team have developed a guidance document to support contractors taking part in the scheme, this guidance is a refresh of the publication prepared for the November declaration and is intended to be read in conjunction with the Pharmacy Quality Payments Gateway Criteria Guidance and the Pharmacy Quality Payments Quality Criteria Guidance. 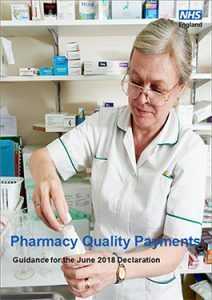 The Pharmacy Quality Payments – Guidance for the November 2017 declaration guidance, which was published to support contractors with the November declaration has been superseded and therefore has been removed from the NHS England website, if you would like a copy of this please email your NHS England team. Please find the publication at https://www.england.nhs.uk/commissioning/primary-care/pharmacy/framework-1618/pqp/.